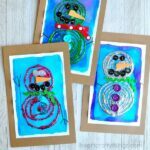 After we made our swirly glue snowmen last week my daughter said, “Hey Mom, we could also make Christmas trees!” She always has the best ideas! 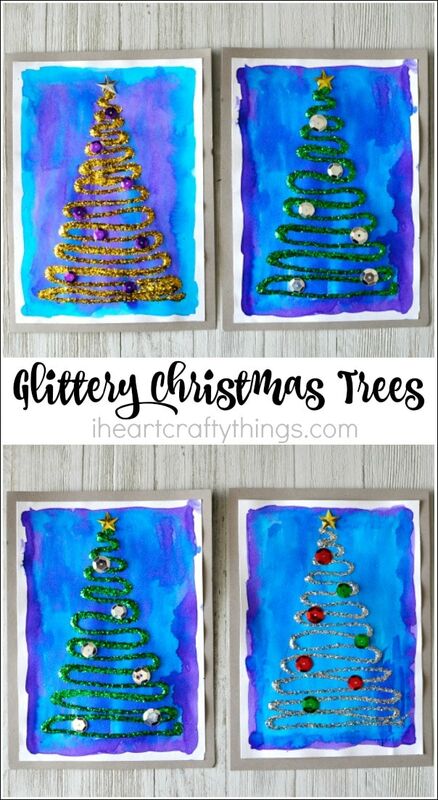 So behold, this weekend we got our “glitter on” all over again and made this gorgeous glittery Christmas tree craft. 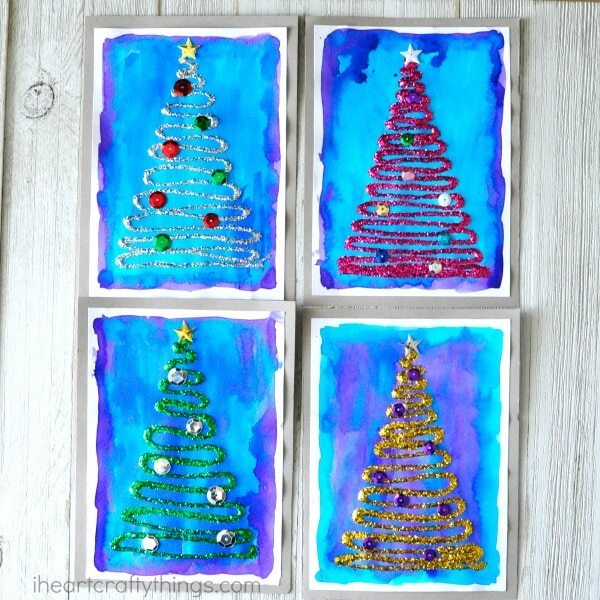 These would make fabulous DIY Christmas cards or can even be made for a gift for Grandma to adore during the holiday season. 1. Start by painting your piece of mixed media paper with your blue and purple watercolors. We love how it looks to leave a small border around the edge unpainted but this is totally optional. Let your paper dry completely. When dry, glue it onto your colored cardstock for a frame. 2. 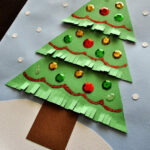 Cut out a triangle Christmas tree pattern from your white cardstock. Trace it very lightly onto your watercolor paper. 3. 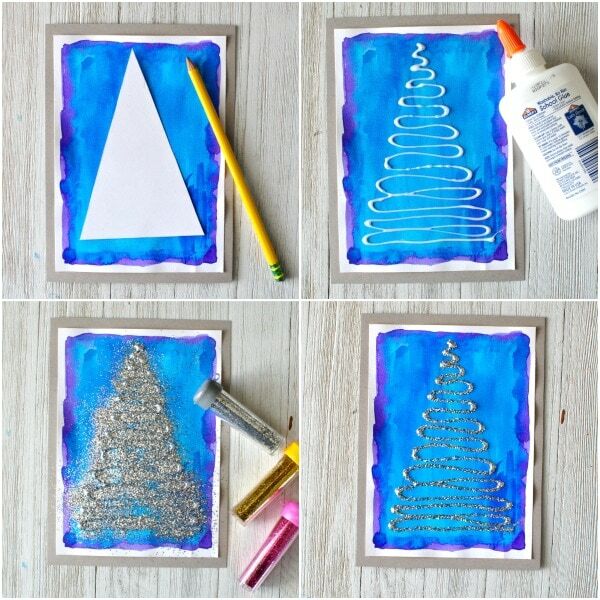 Use your School Glue and starting from the top of your triangle, make a swirly line of glue back and forth along the edges of the triangle to make a Christmas tree. 4. 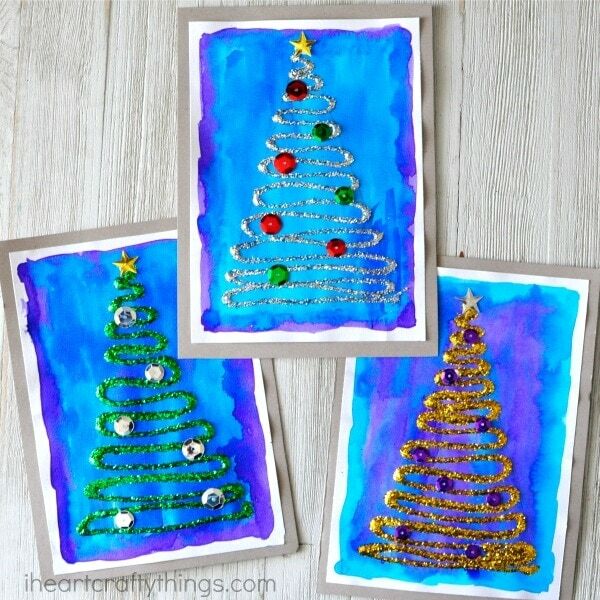 Place your artwork on a place mat or in a cardboard box and sprinkle glitter all over the glue, covering it completely. Then dump off the excess glitter into the garbage or save it for another project. 5. 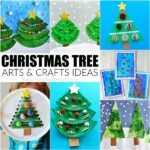 After your glue has finished drying, glue any embellishments onto your tree that you want to your glittery Christmas tree craft. We glued on a star and added sequins for ornaments. 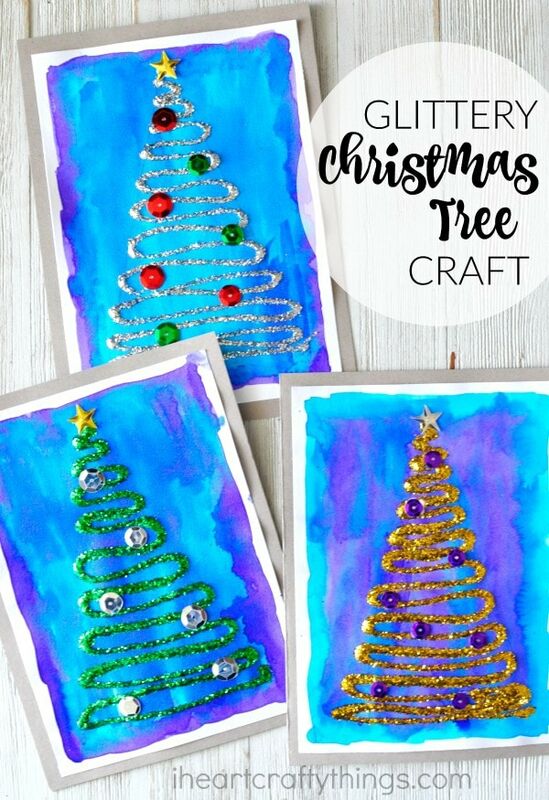 All of the different process and textures makes this an awesome Christmas craft for kids. Put it on display on a mantel or on the fridge, or make it a special gift for a grandparent for Christmas.